Given clear skies tonight, everyone around the world will see the waxing gibbous moon close to the solar system’s largest planet, Jupiter. 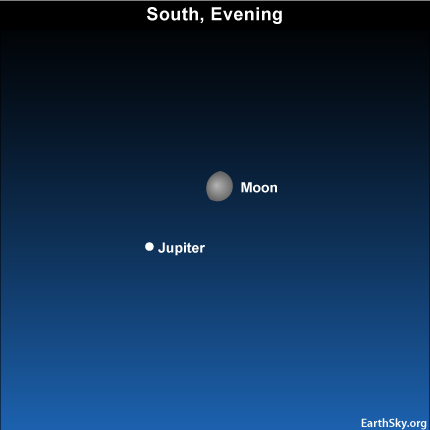 After the moon, Jupiter is easily the brightest celestial object in the November 2010 evening sky. But – generally speaking – Jupiter ranks as the fourth brightest celestial object in all the sky, after the sun, moon and planet Venus, respectively. Venus won’t rise into the eastern sky until close to dawn, so Jupiter now reigns supreme over the evening sky. What’s more, Jupiter will continue to rule the evening sky for months to come. The planet Mars can – sometimes – match or exceed Jupiter in brilliance, but this happens only rarely. On August 27, 2003, Mars came closer to Earth than it had since Stone Age times. Mars appeared marginally brighter on that date than Jupiter appears tonight. Looking ahead, Mars will nearly match Jupiter in brilliance in May 2016. It will outshine Jupiter in July 2018. Even though Mars can exceed Jupiter in brightness, Mars can never appear larger than the king planet as viewed through a telescope. During Mars’ extra-close encounter in late August 2003, Mars’ angular diameter swelled to only 60% of what Jupiter exhibits tonight. Where is Mars now? 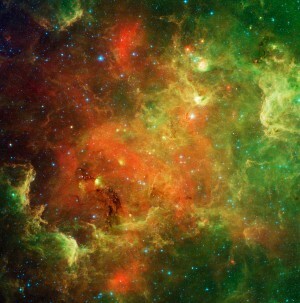 You won’t find the red planet easily. It’s currently just a small glimmer in the glow of evening twilight. Site contents copyright © 2019 Recorder Online	except as noted. All rights reserved. | 88 queries in 2.378 seconds.